A fresh sheet of ice covering a lake. The powdery snow shoveled off to the sides. A sharp chill hanging in the air. If you're lucky, a warm drink waiting for you at the end of the day. These are the elements that made outdoor hockey so special for a generation of players. 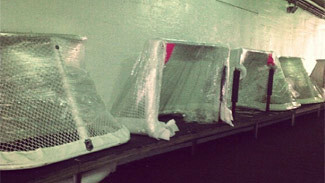 As the game began to move indoors, they became symbols of a bygone era. But with a little help from the massive annual spectacle that is the Bridgestone NHL Winter Classic, many modern players are discovering the joy of the outdoor game. And a generation of Hockey Hall of Fame members who grew up playing on the local pond couldn't be happier. "We had a little irrigation ditch probably 50 feet from our front porch. That was the first thing to freeze. The river wouldn’t freeze for another two or three weeks," Hall of Fame player Bryan Trottier said. "I just remember I was 6 years old at Christmastime and we would go down and skate. We froze to death, nose got cold. We swore we would never do it again, but later we'd be right back there. It was just so much fun." On the lake, Trottier developed a game that would help him win the Stanley Cup six times as a player. But like most hockey parents, his children grew up playing at the local arena. Surprisingly, it was his son who gave him an opportunity to enjoy the outdoor game again. Bryan Jr. was living in Minnesota, which in the past few years has seen a slew of outdoor hockey tournaments spring up. Alerted to the opportunity to play outdoors again, Trottier and his son registered a team to compete in one of the myriad pond hockey tournaments. Before long, Bryan Sr. was competing in similar tournaments across North America, but his attempts to keep a low profile at these events didn't quite work. "I would shave my mustache and go there. Next thing you know, someone yells, 'Bryan's here,' and the cat is out of the bag," Trottier said. "My son invited me to the big tournament in Minnesota. I was going to be the ringer. A 55-year-old ringer? I don't think so." That Minnesota tournament, the U.S. Pond Hockey Championships, has been at the forefront of a wave of outdoor tournaments popping up across the continent. "Someone had shown me a photo of this larger pond hockey tournament. I thought, wouldn't it be great to do something like that in Minnesota?" said Fred Haberman, founder of the U.S. Pond Hockey Championships, which is staged every January on Lake Nokomis in Minneapolis. "Just have this huge pond where people could come play hockey and celebrate the way we used to play when we were kids. Create a reunion, both with our youth and our friends." This year, the U.S. Pond Hockey Championships will host around 300 teams and thousands of people. That's impressive growth for an event that started in 2006 with 116 teams. The level of competitiveness may be high, but more than anything the three-day event is an opportunity for hockey lovers to congregate and celebrate. "I went out and just bought boards for 25 hockey rinks. U.S. Pond Hockey Championships was really my midlife crisis gone out of control," Haberman said. "I think it worked because it resonates so deeply with the kid in so many people: the purity of the way the game is supposed to be played, the way so many of us grew up playing." 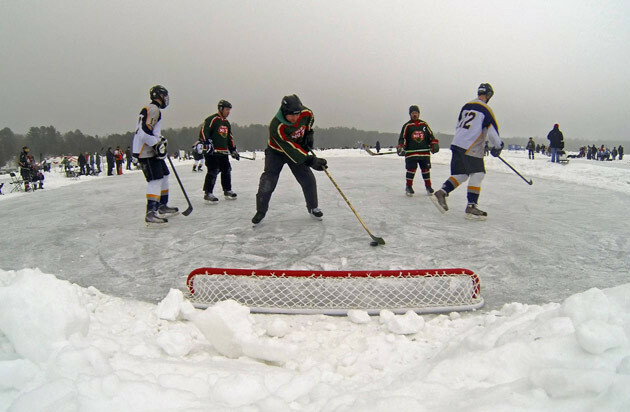 The outdoor craze may have taken off in the State of Hockey, and it hasn't taken long for the trend to spread elsewhere. Pond Hockey Classic is one of the organizations that has helped satiate the growing appetite. The organization started with the New England Pond Hockey Classic on Lake Winnipesaukee in New Hampshire in 2010 and has launched similar events on Lake Champlain in Vermont and in Kalispell, Mont. The New Hampshire event ballooned from 77 teams in 2010 to 175 last year, with an additional 40 to 80 teams placed on a waiting list. "You've seen how it has grown. For whatever reason, in the last 10 years people have really embraced bringing the sport back," Pond Hockey Classic founder Scott Crowder said. "The pros want to do it, the guys who are done playing want to do it. It just strikes a chord with anyone who has ever strapped on a pair of skates." For players who grew up playing outdoors and have found their way to the NHL, there might not be a more surreal event than the Winter Classic. Played in front of tens of thousands of fans, the annual spectacle has become a marquee event in the sports world. And for League players who can remember what it felt like to pick up the game on the local pond, it's a unique opportunity to relive some cherished childhood memories. "For every kid that has played in the Winter Classic, or is going to play in the Winter Classic, that's exactly what they did for probably the first 10 years of them playing hockey," said former Detroit Red Wings forward Kris Draper, who played in the 2009 Winter Classic at Wrigley Field. "I was lucky. My house was the last house on our street. My dad made a rink every winter for me, and I was able to walk outside my side door and onto the rink. I skated for hours. It didn't matter how cold it was, being out there was always something I loved to do." As the mystique of the outdoor game has emerged in recent years, a small selection of customized rinks have earned a legend all their own. Perhaps no home rink exemplifies that more than the sheet of ice belonging to Pat LaFontaine, a Hockey Hall of Fame member who is the Buffalo Sabres president of hockey operations. It's known simply as "The Barn," and it might be one of the most impressive home rinks in the country. Overlooking Long Island Sound, it sits beside the LaFontaine family home and contains every conceivable amenity: locker rooms, home and away benches, a public address system, lights, and a Zamboni. It really is a rink of dreams. "It stems back from my days as a kid playing out on Williams Lake in Michigan," LaFontaine said. "My dad and my brother and I played minor hockey together. My mom would always have the hot chocolate ready for everybody. The neighborhood kids would be out there. We would skate all day after school." In recent years, The Barn has held practices for minor-league teams of varying levels, including the Moncton Wildcats of the Quebec Major Junior Hockey League, who were coached by Sabres interim coach Ted Nolan at the time. A commercial starring actor Michael J. Fox was shot there in 2010. But the main event at The Barn is the annual tournament, appropriately named the Williams Lake Cup, which hosts teams captained by former NHL players and actor Denis Leary. "There was a moment when [former New York Islanders] Clark Gillies and Bobby Nystrom were playing against each other. They got stuck in the corner with the puck. They're pushing each other and laughing. Then all of a sudden they're getting serious," LaFontaine said. "They probably hadn't been like that in 20 years. Everybody saw it. It was a moment. That's what The Barn does." For a long time, LaFontaine's home rink was the only way current and former NHL players could revisit their childhood and take the game outside for few hours against a surreal winter backdrop. But the League has helped foster the resurgence of the outdoor game by fully embracing an annual event that has become among the most anticipated in sports. In the 2013-14 season, the League has given fans more opportunities than ever to participate in these outdoor spectacles. 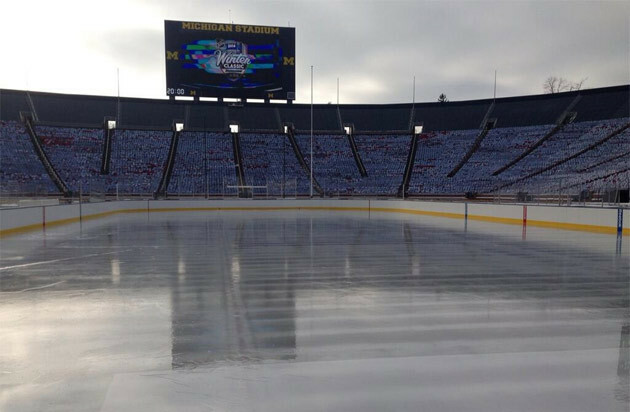 The 2014 Bridgestone NHL Winter Classic between the Toronto Maple Leafs and Red Wings at Michigan Stadium could set a new hockey attendance record. But the outdoor events won't end at the Big House. The Vancouver Canucks will host the Ottawa Senators at the Tim Hortons NHL Heritage Classic at BC Place on March 2. That will be the final outdoor game of the season after the League stages four games in three legendary venues as part of the Coors Light NHL Stadium Series. With two taking place at Yankee Stadium, and one each at Dodger Stadium and Soldier Field, the new era in outdoor hockey will be taken to the next level. It began Nov. 22, 2003 with a regular-season game between the Montreal Canadiens and Edmonton Oilers at Commonwealth Stadium in Edmonton. Oilers president and COO Patrick LaForge was the man behind the idea, although he never guessed it would grow into such a phenomenon and help the world develop a new appreciation for outdoor hockey. "We were always thinking about Lake Louise and a natural-ice setting, some kind of pond. It would have to be in Northern Alberta. There's lots of lakes around Edmonton. We could do this. This is possible," LaForge said. "Standing beside Gary Bettman down by the glass as the game was just about to start, Gary looked at me and said, 'This might be one of the best moments in NHL history.' It’s not even about the game, really. The score won't be reported. What will be reported is that it happened." Playing in frigid temperatures, the Canadiens defeated the Oilers 4-3. But it was the incredible atmosphere that day at Commonwealth Stadium that most people recall when conversation of that first-of-its-kind event arises. 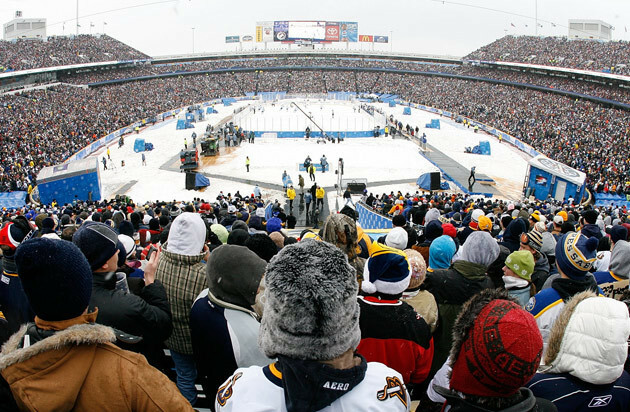 The NHL outdoor game truly arrived on Jan. 1, 2008, when the Pittsburgh Penguins defeated the Sabres 2-1 in a shootout in front of more than 71,000 people at Buffalo’s Ralph Wilson Stadium in the first Winter Classic. Since then, outdoor games have been held at countless venues and featured teams from the NCAA, American Hockey League, Swedish Elite League and other competitive pro and amateur leagues. They’ve all contributed to the growth and appreciation for the outdoor game. "There's no doubt of the impact the [Winter Classic] has had on hockey. It's been so well-received both in Canada and the United States," former NHL player and general manager Lou Nanne said. "It's become a tremendous event. We're having the (University of Minnesota) Gophers play Ohio State here (in Minnesota on) Jan. 17, and the tickets have been going gangbusters." Nanne should have a true appreciation for hockey's outdoor origins. He grew up playing on ponds in southern Ontario before becoming a hockey icon in Minnesota, one of several states to have embraced the majesty of the outdoor game. After competing at the University of Minnesota, Nanne played for the Minnesota North Stars before becoming the team's general manager. A member of the United States Hockey Hall of Fame and International Ice Hockey Hall of Fame, Nanne remains a fixture in Minnesota's rich hockey community and is pleasantly surprised by the numerous outdoor hockey events that have sprung up throughout the State of Hockey. "It certainly helped the growth of hockey and the popularity of hockey. It's just a fun time and a fun event that gets a great deal of coverage and participation. It's been a boon to hockey overall and for the individuals who get to experience it," Nanne said. "It brings me back to growing up in Sault St. Marie. It's almost become cultlike behavior now. People that experienced it and people that didn't experience it getting the opportunity to play outside and play in these types of tournaments has really become extremely popular. The games here are sold out, they're so well attended. For many that never had the opportunity to do it, it gives them a new experience." The 72-year-old was part of one of the last generations to pick up the game on the pond. But with the outdoor hockey renaissance, a whole new generation is discovering the unique intricacies of the outdoor game. It certainly wasn't by design, but that resurgence has unexpectedly altered the way young hockey players are being developed. For years leading up to the 2003 Heritage Classic in Edmonton, hockey development had gone exclusively indoors. Anyone looking to learn the finer points of the game was restricted to the local arena. That meant finding the time, and often the money, to hone skills on an indoor surface. With the outdoor-game boom, young people are returning to the local pond, and in doing so they’re gaining a new approach to and appreciation for the game. "It gives them a chance to really enjoy playing hockey. It's a different experience than a scripted practice inside. It gives them a chance to really have fun. It's something they'll relate to for the rest of their lives," Nanne said. "I think it's really grown. I think in the last 10 years there has been an explosion." More than the scores and statistics, it's those memories that are indelibly linked to the outdoor resurgence. Whether it is children getting some time on the local pond or the fans tuning in to the Winter Classic on New Year's Day to enjoy an epic annual sporting event, young people are creating new memories that will endure for a lifetime. Even for the few hockey players who have been fortunate enough to compete in multiple outdoor games, the novelty hasn't worn off. Ask any pro or amateur player who has competed in an outdoor stadium and they'll list that experience among the highlights of their career. "It's so incredible to play outside and just get that fresh air," New York Rangers forward Carl Hagelin said. "You just feel like you can skate forever, even if the ice is not great, depending on the weather." If there's anyone who could be considered an expert in the intricacies of playing outdoors, it might be Hagelin. As a player at the University of Michigan then with the Rangers, the Swedish wing competed in a major outdoor game in three consecutive seasons. It started during his junior season at Michigan when he competed in the Camp Randall Hockey Classic on Feb. 6, 2010, when his Wolverines lost 3-2 to the University of Wisconsin in front of more than 55,000 fans. It was a landmark moment for young Hagelin, although it was only the first in a series of outdoor appearances. "That was a tough one in Wisconsin. It was windy," Hagelin said. "The first period, when we went their way, it was like pushing a sled down the ice. It was tough." The following year, Hagelin closed his senior season with a game against rival Michigan State on Dec. 11, 2010. In what was billed as the "Big Chill at the Big House," Hagelin scored twice in a 5-0 win against the Spartans at Michigan Stadium that set a new attendance record with 113,411 fans on hand. Hagelin hosted 30 family members at the game and still looks back fondly on the experience. The following year, in his first pro season, Hagelin participated in the 2012 Bridgestone NHL Winter Classic at Citizens Bank Park in Philadelphia. In front of almost 47,000 fans, the Rangers defeated the Philadelphia Flyers 3-2 in an epic contest that only added to the Winter Classic legacy. Hagelin is eagerly anticipating the Rangers' two upcoming Yankee Stadium games, Jan. 26 against the New Jersey Devils and Jan. 29 against the Islanders. "You go out there and play. It's all about what the weather conditions are that night," said Hagelin, who hopes his prior outdoor experience will be an asset in the Bronx. "Hopefully, it will help me a little bit. You go out there and play your heart out." It seems unlikely that anyone, be it a player or a fan, is likely to tire of these landmark events anytime soon. For a generation of young hockey fans, these outdoor games are an introduction to its roots. But for those who first fell in love with the sport on an outdoor rink or pond, it's simply a return to where the sport originated. In the end, it's on that outdoor surface where people come to the realization it's not just about the final score. It's about returning to an innocent time most people would love to revisit. And for outdoor hockey enthusiasts like LaFontaine, it's an opportunity to build a new rink of dreams and create memories for the next generation. "I remember thinking we could have our money put into blue chip stock, which doesn't guarantee anything, or you could have it in waterfront land and create this rink that will have memories that are priceless and for a lifetime," LaFontaine said. "It's one of the best things I ever did. I always say this: Sometimes you have to go back to move forward. Go back to being a kid. I see guys that play who fell in love with the game and have stress in their lives. You can just see their face change when they hit the ice. How great is that? I can't tell you how many stories we've had where guys spend a weekend with the boys laughing."